Extremely rare 70's sign of the times! It feels as sweet as it looks, perfect for any moto-x or motorbike enthusiast. 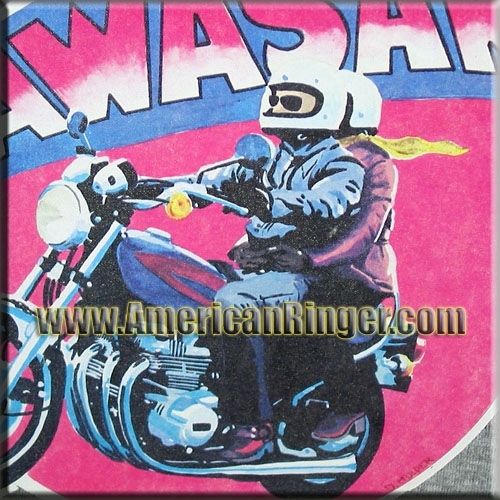 Very hard to find Kawasaki Japanese motorcycle iron-on t-shirt from 1979. These old school street bike moto-x prints are impossible to find! A vintage American Ringer EXCLUSIVE, RARE AND HIGHLY COLLECTIBLE! These shirts are extremely difficult vintage items to find and will sell out very quickly so get yours today! AmericanRinger.com acquired these rare vintage shirts and NOBODY ELSE HAS THEM! This is the real deal vintage stuff and once they are gone they will be gone forever.